As the end of the year approaches, it seems everyone is talking about goals and resolutions…reflecting on what we imagined we’d achieve at the start of the year and having a look at how that compared to where we are at the moment. Way back in September, I decided that after 5 months of blogging, it was probably time to set myself some goals. Maybe they were too ambitious. Maybe they were unrealistic. But I didn’t smash those goals at all. I sort of knew this was going to happen as my return to work meant that for the majority of the week, I couldn’t focus solely on my blog. It felt a bit like I was mourning my blog, as I returned to work – gradually, there was less and less room for ideas, tweeting and posting to Instagram. Now, my blog really was a hobby and I struggled to find the balance. Juggling a new world of trains and childcare, whilst also spending time with the boys as well as writing each week. But in early October, I made a promise to myself that I would keep blogging, even if it meant writing less each week. It is my outlet for everything going on in my life, and I just didn’t want to let it go. So as I look back on the past year, I realise now where I went wrong when setting goals in September. I had plucked numbers out of thin air of where I wanted my social media to be at the end of the year…what I forgot was why I started this blog and why I would grab any moment I could to write more. It was never about my Twitter following or the Instagram algorithm. It wasn’t because I wanted to earn money out of it, or because I wanted to win an award. The truth is that I still don’t have a clue about Instagram (but I love having somewhere that I can easily look back on how much Emma has grown). I’m one of those people whose Twitter feed is full of my own blog posts because I rarely have time to sit down and interact with the people I follow. Facebook is like getting blood from a stone. I haven’t made a single image ‘pinnable’. My page views are way lower than I care to admit, and so many times I publish a post and leave it sitting there for days and days without sharing it on social media (I’m also sadly very forgetful!). But even without reaching those figures that I was hoping for, there is still a whole load of things I am proud of blog-wise. In 2016 I wrote 192 posts, at one point went self-hosted and gave the blog a makeover a couple of times too. I love that I started Bridie By The Sea in the first place – having a blog has made me take more pictures, more videos. It’s made me want to remember more about our every day lives. There was this one time that I was part of a campaign that featured in the Mail Online, which was pretty awesome (it also featured in Stylist Magazine & Prima too). I also wrote for The Huffington Post and appeared on the front page a few times. Most of all, I met an incredible group of mum bloggers thanks to Katie of Mummy in a Tutu. These women restored my faith in the sisterhood and are testament to how much women can rock when we support each other. It was because of some of these girls that I didn’t feel so alone as a new mum in a new city. Was 2016 a blogging success? Well, I may not have achieved the goals I set for myself but this year has been a success for me. It means so much to me to have found something that I am hugely passionate about. In 2017, I have a few things planned for the blog. I am hoping to stick to a consistent posting schedule of Monday, Wednesday, Friday and will be continuing my #DreamTeam linky with the lovely 3 Little Buttons. I also will be blogging a bit more about family travel every Wednesday – so expect a few reviews on days out and snapshots of our holidays from days gone by. You’ve achieved loads and you are right – it’s not all about the numbers. Running a blog and working is an uphill struggle – congratulate yourself on what you have achieved. You’ve achieved loads! you should definitely be proud! I think the problem with setting specific goals is that they are really hard to obtain because of all sorts of different factors, and then the added negative of making yourself feel bad, when you really shouldn’t! Thank you for linking up, I look forward to seeing what 2017 has in store for you! Wow! 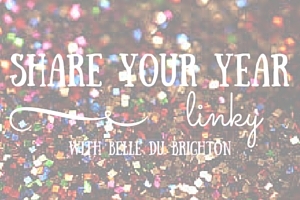 I’ve only recently started following your blog – I had no idea you were based in Brighton so this is an added bonus! You’ve achieved so much this year – even if you didn’t set the right goals. It what you can show for your work is what counts. Good luck for 2017 – I look forward to following you on instagram! I think you have done an amazing job!! Its not even been a year yet and you have achieved so many things and you’re blog looks beautiful. I enjoy reading your posts and looking at your photos, Emma is gorgeous! I’m very glad I met you through tribal chat as well, it really is a great group of women! Thanks for sharing with #StayClassyMama!